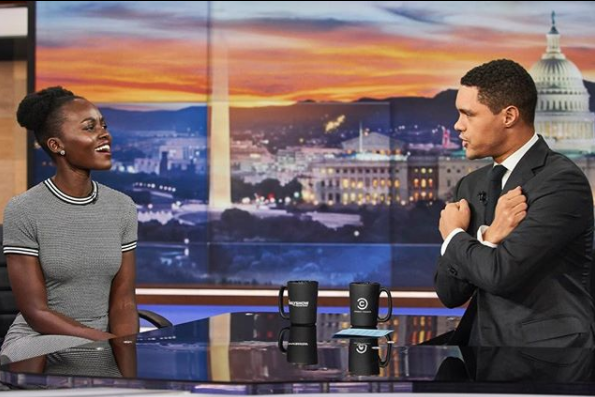 Academy Award-winning actress Lupita Nyong'o will play Trevor Noah's mother in an upcoming biopic about his life. Trevor Noah's life story will play out on the big screen. 'The Daily Show' host revealed this week that his book, 'Born A Crime', will be made into a feature film. Actress Lupita Nyong'o will play Trevor's mother, and will also produce the biopic. “My mom is a powerful woman who could easily be one of the beautiful soldiers in Wakanda. So it’s beyond a perfect fit that she would be portrayed on the big screen by the radiant and regal Lupita Nyong’o. I’m beyond excited,” the South African comedian wrote on Instagram. 'Born A Crime', became a bestseller when it was released in 2016. Lupita is one of the many celebrities who are fans of the book. “When I read @TrevorNoah’s Born A Crime, I could not put the book down. Excited to announce that I will be starring in and producing its feature film adaptation!” she said on Instagram. ALSO READ: Trevor Noah working on Rihanna and Lupita Nyong'o movie? Production is still in the early stages, but South Africans already have a good idea who they think should play the lead role. Twitter users took to the social networking app to beg the producers to cast 'Scandal!' actor Brighton Ngoma as Trevor. The actor not only resembles Trevor, but they also have a similar background. Both Trevor and Brighton have a Xhosa mother and a Swiss father. They both also grew up in Soweto. Speaking to ThishaLIVE, Brighton says he would be honoured to play Trevor. "...it would be a fantastic honour to play someone like Trevor Noah. He has done amazing things and has been a pioneer in our entertainment industry. He's done great things for South Africans and young black Africans."